1 Henry IV was an oddity of its moment. The popularity of its stage performances drew it promptly to the printing houses. In 1598, Andrew Wise, the publisher to first claim the rights to sell the play, found his hands happily full; two editions of the play were released within the year, an unheard-of statistic among Early Modern plays (few plays of the period enjoyed such second editions, much less in the same year). Several more editions followed fast on the heels of these, with quartos released in 1599, 1604, 1608, 1613, 1622, 1632, and 1639, and the Folio version published in 1623. 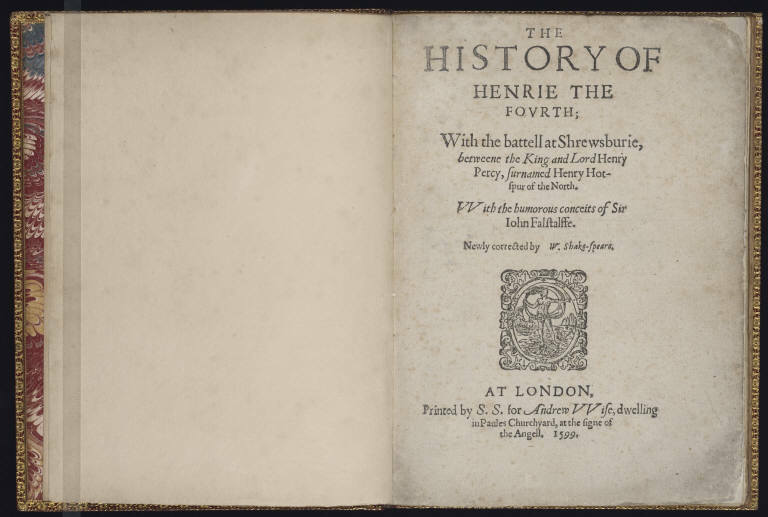 Curiously, history has been unkind to the first editions of the play, with only a few 1598 editions still surviving; then as now, though, books were made to be read, and the paucity of extant first folios may testify to the intensity of the reading they encouraged. Think of the ink blots, bent corners, and frayed edges of your own favorite books; it was not so different then. Had Shakespeare corrected or revised these new versions of the play? Probably not. The claim, though, is a common one among quartos of the time, and it testifies to the precarious financial straits printers frequently found themselves in: to sell the books they needed to get by, they were forced to resort to the kind of measures that would seem disingenuous today, promising changes to texts when they had not been changed at all. The aim of such tactics was to reach customers who already owned a copy of the play, or had gone to see it, as well as those first readers who had never encountered the play before. But from the number of editions of it that were printed, the choice alone to print 1 Henry IV was enough to keep printers afloat—even if only for a moment.